Most days have been spent outside. This yard has been neglected for a long time. We are told that the first owner was a Dutch man and the yard was gorgeous at one time. As I clean flower beds, I keep finding bulbs. I've been replanting them and if they all come back, spring will be a colorful surprise. I have stopped counting how many irises there are here. In the back yard, there was a big raised planter. At the center is a mystery shrub or tree. I am told it might be a pomegranate and if it is we will keep it. 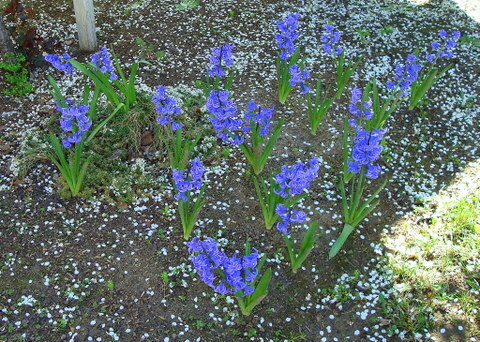 It was surrounded by irises that have probably not been divided in years. 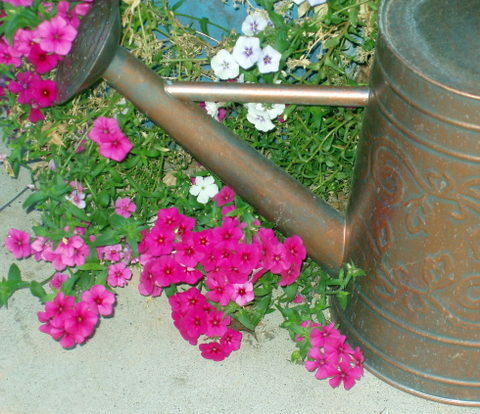 I have been digging them and up and moving them around the yard. What you see is a circle of about four feet around the tree that I am gradually making my way towards. There was a huge tree stump in one of the flower beds. When I started pulling off all the shoots, we discovered a rose bush. It has just two shoots but look at the pretty pink rose that bloomed. On the other side of the yard, there were two more roses and I cut them way back. I wasn't sure if I had killed them but they were tall and leggy. Today there are roses on both. One a pretty dark pink and one a light peachy pink. We also have a rose bed in the front yard that has about 20 roses. It is so much fun to see them bloom and each one is a different variety. I'll show you pictures of that soon. Right now, I can't leave the "baby". I have a new gardening companion. This four legged beastie, who is supposed to be my son's puppy, is now my shadow. Every where I go, he follows and cries if I dare to leave him behind. As companions go, he's alright. If I could get him to leave the irises where I've planted them and stop making puddles in the house, he'd be perfect. What a beautiful day. A beautiful garden was the setting. The flowers were all in bloom. The bride was beautiful. The groom, a long time friend of my sons, was serene. It was a day we all had looked forward to. The pastor was the groom's father and had a wonderful story to tell. He and his wife had started praying for not just their son, but his future wife also, from the moment they knew they were having a baby. Many of us were misty eyed as we watched them take their vows. A perfect day to celebrate. ...a week went by just like that! I did not mean to be gone so long. I blame it on my daughter. When the fan died on my desk top computer, she talked me into buying one of these. So, I've been spending lots of time getting acquainted. So far, I've found out that riding an exercise bike isn't so bad if I can see my lap top. I've been watching the BBC series, Cranford and my son introduced me to the Carnivale series from HBO. Carnivale has me hooked. I'm thinking that buying a caravan and roaming the world would be kind of fun. Of course, I would have to stop where there was indoor plumbing and showers. for my nephew to graduate from high school. His graduation was set against this backdrop of beautiful mountains. The flowers in my patio did not mind the rain and thunder. My geraniums are growing like crazy. Look at my lady finger grapes. I think this may be their best year yet. So, that's where I've been. Not much sewing going on here. Though I do have a few ideas floating around in my head and my fingers are itching for some new fabric. I think that the cooler temperatures and the breezy days have chased away any depression that was lingering. For those of you who wrote me about this being the product of menopause. I had a hysterectomy three years ago. I took hormones for awhile but then decided that I did not want to deal with the side effects. I blame it on the t.v. too. With my mother's constant need for the television news, I don't hear the same news story once. I hear it over and over, all day long until I want to scream. So, if I don't show up here for a few days, don't worry about me-I'm out in the back yard screaming or pulling weeds...one at a time...while cursing the FOX new's network! My weekend started with the yummiest lunch at an Armenian restaurant with my daughter and son-in-law and his parents. They came bearing bouquets of tulips for me, my mother and my son's mom. All in shades of pink. An hour and a half after lunch found us driving up to the mountains for a barbecue at my brother's house. His in-laws were celebrating 50 years of marriage. They are the sweetest couple and no one would ever guess that they were old enough to be married for 50 years. No...no pictures. I forgot my camera! Sunday morning, my oldest son woke me up with a phone call from Kansas. He is there getting his fiancee packed up and she is moving here next week. We're all very excited and can hardly wait for them to get back. My hubby took me to Fresno's Shinzen Japanese Garden in the afternoon. What a beautiful, beautiful place. It is so serene and calming there. My hubby had never been there and was amazed at what had been hiding from him behind the tall stands of bamboo at Woodward Park. We walk at the park occasionally, but, up until recently, the garden was only open on weekends. If you live near Fresno, I urge you to visit. The gardens are open on the weekends and now open from 5 p.m. until dusk week days. It was in the high 80's yesterday and we were able to hide from the heat in the shade of the gardens. Last night, my hubby and youngest son cooked dinner. Well, it was really breakfast for dinner. It was so yummy too. Cheese eggs, bacon and sour dough toast. I didn't even know my hubby knew how to cook breakfast!! I think I am turning that job over to him now. Later, my youngest son drew a name for my lace corsage winner and that person is Lavender Dreamer. Please email me and let me know what color rose you would like in your corsage. In a little bit of other news, I had my exam for my driver's license and my doctor declared me in good, stable condition and able to drive! I wanted to hug him. Thank goodness I have these flowers to look at. Because the sight of these just about made me cry. 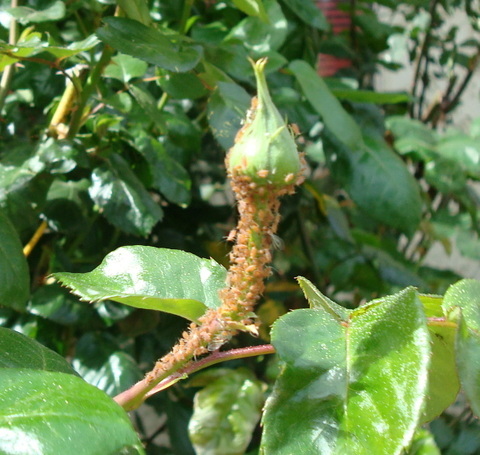 Aphids! I sprayed them this morning. Soap and water didn't work over the weekend. Hopefully, I will see some roses soon. Bad garden mother. Sigh. At least I saved the geraniums from the snails. 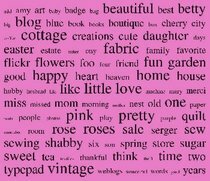 I was surfing around the net and found a site that makes a little category cloud of your blog. (I forgot to bookmark the site) This is mine. It is missing something though. I don't see shopping! I love to shop online. Look what I bought from Lallee at Lallee's Cottage. Miss Peepers. Isn't she cute? I just giggle whenever I look at her. Speaking of birds. Thursday is Karla and Beth's Bling your Birdhouse Day. I have a pretty pink one that I'm working on. 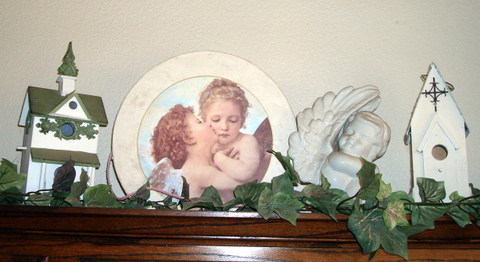 These sit on top of my china cabinet. I buy a lot of my birdhouses in the garden department. It's my favorite place to shop in the spring time. I found this pink marguerite last week. I've never had a pink one. Now, if only I remember to buy snail bait before they eat all of my plants. 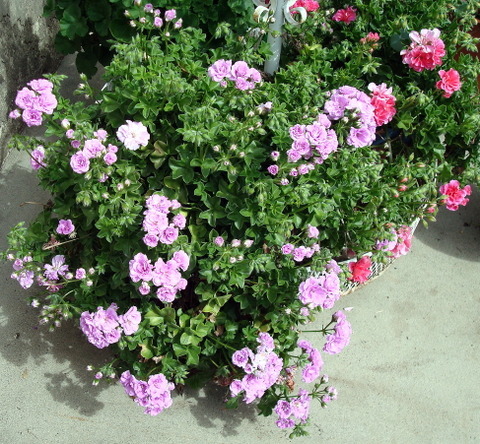 I picked ten snails off of one geranium. Did I mention yard sales? This is my favorite yard sale find. I bought this plant holder from a neighbor who was moving. It belonged to her mother. She almost cried when she sold it to me. I promised to take good care of it. I have it outside my bedroom window so that I can hear the chimes. I guess I should have moved the empty pots out of the picture. But, they're a reminder. I need to go shopping. Snail food and more plants. Look what I found! My son was home yesterday morning. So, I went out to the second day of an estate sale in a town near by. I don't even want to know what I missed out on. There were still many tea cup sets and lots of porcelain for sale. I fell in love with this pretty pink Royal Albert cup and saucer. It was my splurge at ten dollars. 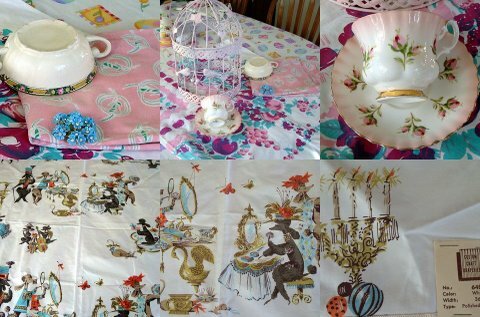 I also found a small pink, blue and plum vintage tablecloth. The cute poodle fabric was under a table. It's an old drapery sample. Can you even imagine a room with curtains made out of that? I'm thinking lots of white foo foo furniture and gold bling. I love it. You'll have to tell me what you would do with it. The bird cage is actually one I found at an estate sale a while back. My youngest son spray painted it pink and I've been moving it around looking for a place to show it off. It was a bargain at three dollars. Yesterday was a beautiful spring day and today promises to be the same. I worked in the yard while my mom took a nap. My pretty hyacinths are almost done. I planted then in a sunny spot six years ago. Now a big blooming shade tree hangs over them. They were the decorations on tables at our garden wedding. They were purple and pink and this year they came up almost blue. I planted some lavender, phlox and snapdragon seeds. I've still got lots of weeds to pull but at least three flower beds are done. With all of this sunshine, I should have more flowers to show you soon. Paula at Patterned Paper Princess tagged me earlier this week to share seven random or weird things about myself. I've done this before, but I'll try to find some more random facts to share with you. We spent Saturday at a Fresno State Football game. I forgot my camera. #1. I am a big Fresno State Football Fan. We won 35-0 and I screamed myself hoarse. #2. Thank goodness Fresno State won, because my favorite pro football team is the San Francisco 49ers and they lost today 15-33. #3 I like creative kids. 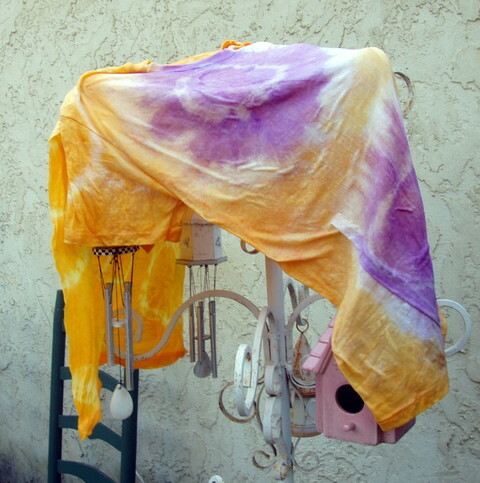 While the 49ers were getting their butts kicked today, my son and I tie-dyed. 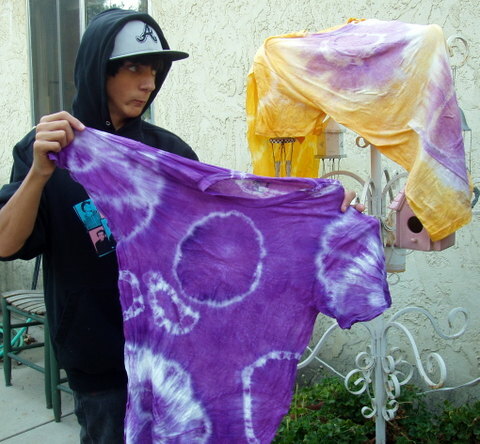 The purple shirt, he did by himself and it turned out the best. #4 We don't have a clothesline. So we used the plant rack for drying shirts. 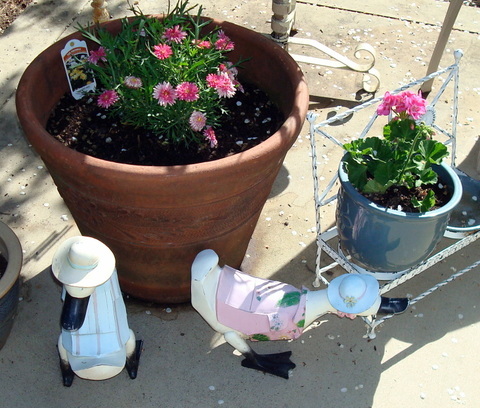 #5 The plant rack is on the patio where I love to garden and grow flowers. 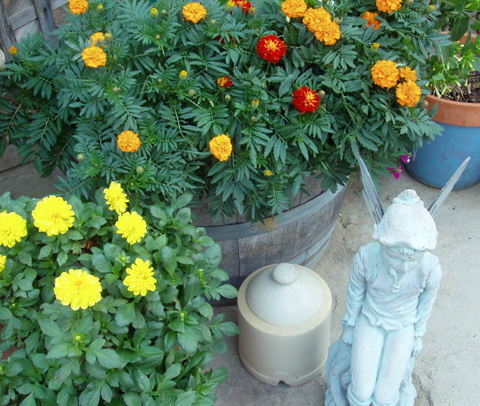 These marigolds came from a little tiny can of seeds at the Susan Branch shop. I can't remember what the yellow flowers are called. #6 I am guilty of planting things and forgetting what they are. I also don't know what these pink flowers are called. Any suggestions? 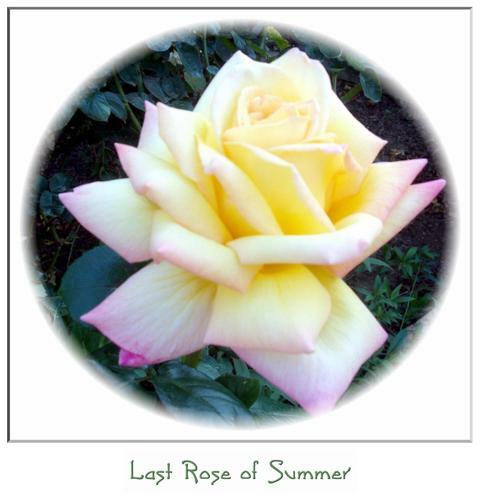 #7 Roses are my favorite plant to grow and this is one of my favorite roses in my garden. I'm pretty sure it is a Peace rose. Thanks Paula, this was fun! I am tagging my daughter Christy, Analise at Sugar*Sugar, Mary at And Sew to Sleep and Jenny at Old Bag New Tricks. Have fun ladies! It has been beautiful here for the last two days. We shut off the air conditioner and opened the windows. The wind is blowing. 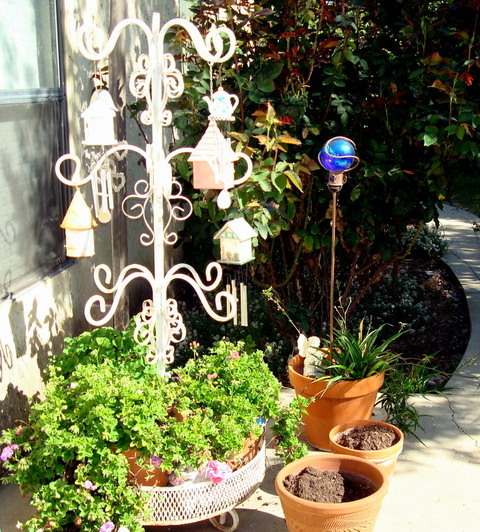 I can finally hear my wind chimes and now I remember why I love California. The air was actually so bad here last week, that we were advised not to go outside. This week, I managed to prune some roses, pull some alyssum that had dried to hay and do a little cleaning up in the yard. It was in the low 80's today which may seem hot to some of you, but, it is heavenly to us. 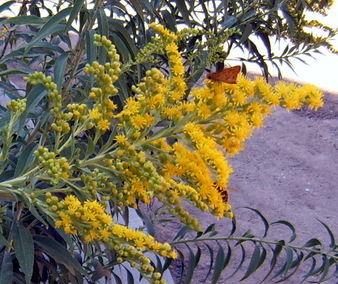 The yellow mystery plants are blooming. The heat has affected them somewhat. Usually at this time of year they are much bigger and have more blooms. They're still pretty. I found cuttings of them at a give-and-take plant trade put on by our university a few years ago. They are mystery plants to me because I don't know what they are. They multiply like crazy and are now in two separate spots in the yard. I'm hoping Carol at Boxwood Cottage will stop by and tell me what they are. 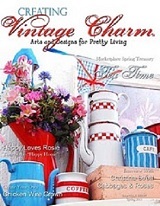 Have you seen Carol's blog? 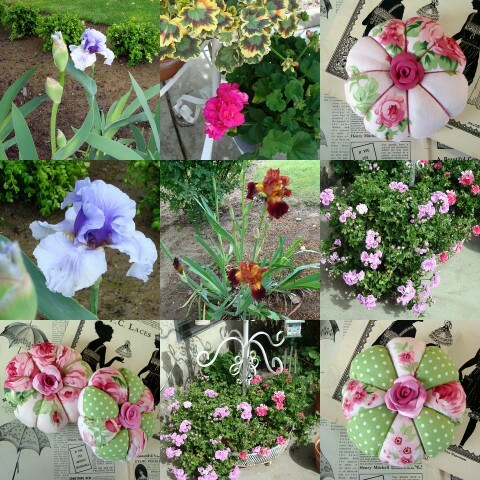 Her garden is absolutely gorgeous. When I wasn't outside working in the yard, I was setting out the fall decorations and working on this little Halloween box. 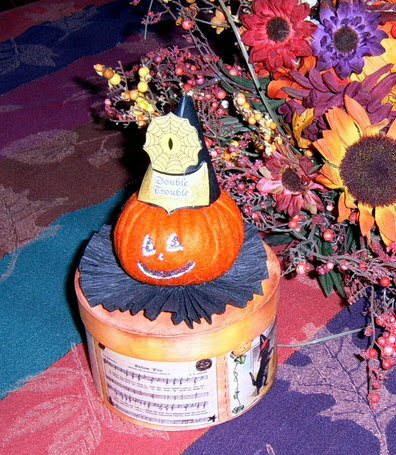 I made the jack-o-lantern from felt and used three different inks to stain the box before I decoupaged it with Halloween graphics. I went back over it with a black pen and added stars and silhouettes. I think he is headed for my Etsy shop. The hubby wants me to thank everyone who sent him well-wishes. He is feeling much better today just in time to go back to work and take care of the other sick people. Yesterday, he felt well enough to go with me to the estate sales. He couldn't talk to me as talking set off a bout of coughing. I have to tell you about the last sale we went to. Oh my Gosh! The lady lived in a mobile home. As mobile homes go it was pretty big. Every single surface and wall space was taken up by some form of collectible. From Coca Cola and Betty Boop to carousels, dolls and cars. She had one of every thing. There was so much stuff; it was overwhelming. 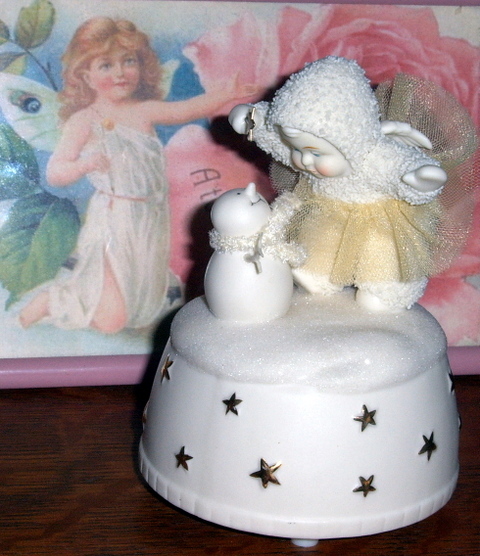 I did manage to buy a Department 56 Snowbabies music box to add to my collection. Isn't she adorable? It plays "Let it Snow" and it was only $5.. It is the first one I've bought for myself. My collection takes up one shelf. 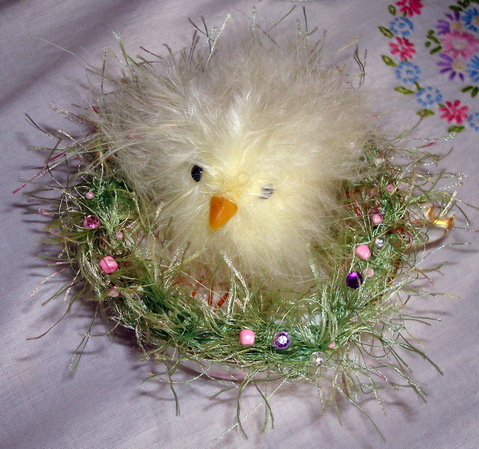 Every snowbabie was given to me as a gift by my daughter, my friends or by my ex-husband. I like to think they were all given to me out of love but, I'm not so sure about the ones from the ex. I always leave these kind of sales wanting to go home and edit my treasures. Do I have too many? I give things away little by little to my family. My hubby did talk a little bit after that sale. He made an excellent point. With all the money that woman spent on collecting, she might have lived in a much nice area and in a much better house. I think he might be right, but don't tell him I said so. 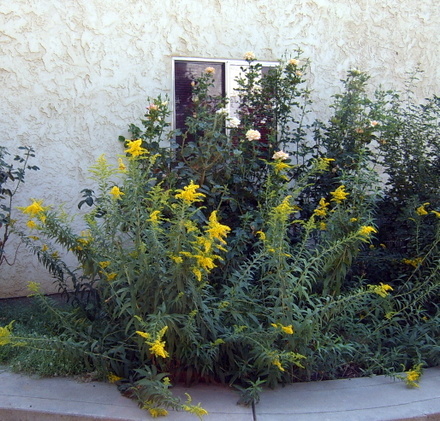 As for me, it was 107° yesterday and the temperature is supposed to drop to a cool 98° today, so I am going to try to do some weeding. 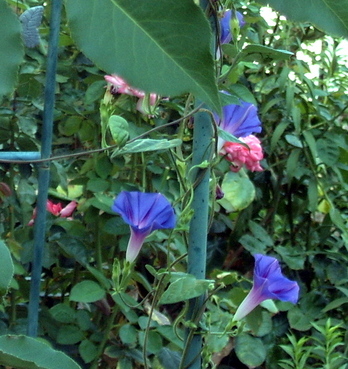 The morning glories are thriving and so are the weeds. First though, I thought I'd start inside by weeding out some of my collections. I'm going to bring my daughter some linens. The look on her husband's face as I give her things to take home is priceless. He doesn't seem to understand the "collecting thing" at all. This is a Flickr badge showing public photos from She'sSewPretty. Make your own badge here.